We own and run a variety of well specified high quality craft. We ensure they carry all of the relevant safety kit, have suitable electronics on board and are kept in really good condition. Ribcraft 7.8m ~ ‘Hunter – based in Lymington Hunter joined the fleet at the start of 2014 to be our boat for our sister company in Lymington – Aquasafe. Like Harrier and Mistral, Hunter was also at the Olympics and worked as a Media boat taking the world’s press out to the sailing courses in Weymouth to get video and still images. 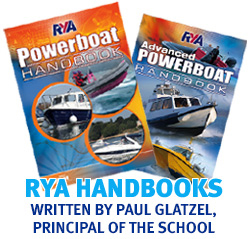 Fitted with a Yamaha 225Hp 4 stroke engine and Garmin and Icom electronics she is a perfect teaching boat for all of the courses we run in the Solent. Even more RIBs!! Because of our relationship with Solent RIB Charter (here) we have access to a fleet of 22 6.8 to 10m Ribs. This gives us unparalleled access to additional craft so that for commercial users we are able to teach an almost unlimited number of students at any time. RNLI D Class + RNLI Y Class ex-Lifeboats Just under 5m long and powered by a 2 stroke Mariner 40Hp this is a hugely capable craft. We use the D and Y class boats for specialist training and for those that want/need training on tiller controlled craft. The D Class went into service in 1996 as D496, the Leonard Stedman at Hayling Island. It was replaced in 2005 and then formed part of the relief fleet before we acquired it. Logic Marine 170CC ~ ‘Poole Boat Hire Boats’ Occasionally we need extra boats for training and the fleet of Logics run by Poole Boat Hire (now a separate company but previously part of Powerboat Training UK) are a great alternative to the RIBs. We tend to use them only for children’s courses and instructors courses – the way they can be a bit of a handful in the wind keeps the potential instructors on their toes!! Other boats We have access to a number of other Motor Cruisers that we charter in for training as required. All of these are certified for RYA training and include: Rodman 11m twin shaft; Rodman 13m with twin IPS drives; Nimbus 12m with twin shafts; Sealine 42ft with twin shafts; Princess 20m with twin shafts If you have a motor cruiser that you may consider for training we would welcome the opportunity to discuss your craft with you. Seadoo GTX255 – based in Poole We added this Seadoo during 2011 and it has proven a great addition to the fleet and is used on both the one day PW Course and the PW Instructor course. Other personal watercraft/’jetskis’ For larger courses we have access to a variety of Yamaha and Seadoo PWs.